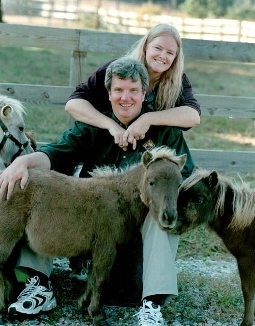 When my husband read me a story about a lady with a guide pony, I couldn’t believe my ears. 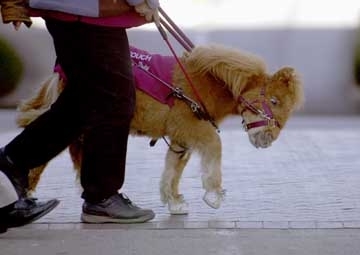 It was hard to imagine a two-foot tall pony. But they do exist. Last year the first one by the name of Cuddles was placed with Dan Shaw, who has suffered with Retinitis Pigmentosa since he was seventeen. 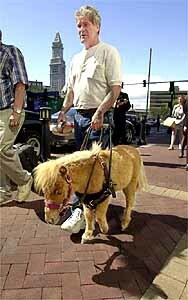 The idea occurred to Janet and Don Burleson of Kittrell, N.C. while walking their own pet miniature horse. She showed an amazing natural tendency to guide by leading her handler around obstacles in crowds, finding the safest path. 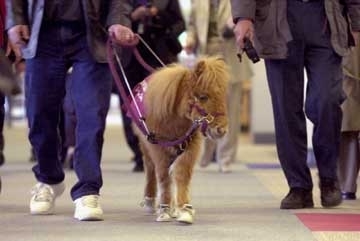 It is a necessity for a mini to watch their footing in order to protect their legs. This prompted Janet, who trained Arabians for thirty years, to try something new and unheard of. 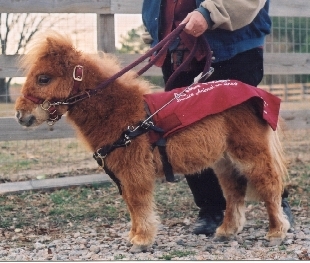 Many choose a guide pony because of dog allergies or a fear of dogs. Some want an animal with a longer life span. 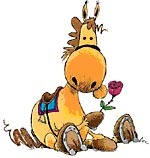 Horses can live thirty to forty years. And then there are the horse lovers. Although, the ponies can be house broken they need to live outdoors with plenty of fresh air. 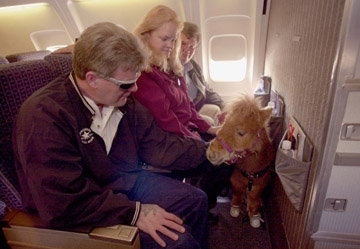 Therefore a recipient of a pony must have an adequate place to keep them. For centuries horses have shown a natural instinct to guide. If a horse in the wild goes blind, another will take reconcilability for it and guide it along with the herd. Through history, they’ve been recorded to successfully carry their wounded riders to safety. During wartime, cavalry horses remained focused and sure in the heat of battle. Police departments have also used them in chaotic situations relying on their steadiness. 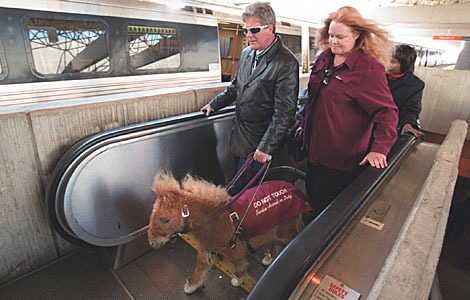 Blind riders have reported riding alone for miles, their horses never faltering to guide them along a secure path. It is a proven fact that horses possess phenomenal memories. They also have excellent vision in the day as well as night. 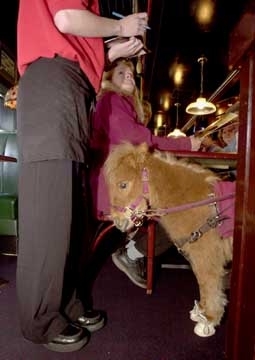 The Burleson’s ponies go through a rigorous training program exactly like a guide dog’s. They also undergo the same systematic desensitization training that is given to riot-control horses. These little animals have to meet all requirements to become a trusted guide for the blind. It takes around eight months to train one and isn’t always easy. Don tells of the first time they took one to the grocery store. It grabbed a Snicker bar off the shelf. When crime novelist Patricia Cornwell heard about the mini guide horses at the Burleson ranch, she decided to pay them a visit. 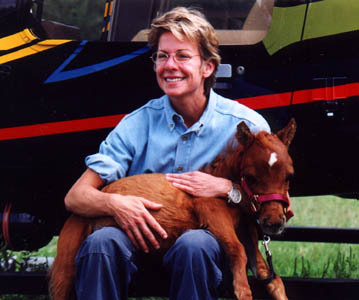 Doing research for her novel, “Isle of Dogs”, She planned to include a character that used a guide pony and wanted to see first hand how the little horses worked. After putting on a blindfold and taking a walk with one, she was so impressed she donated $30,000 to the foundation. Six new ponies were purchased and immediately put into training. 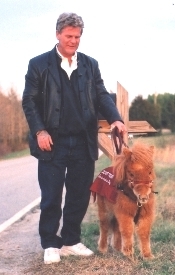 The Guide Horse Foundation is a non-profit charity dedicated to providing free guides for visually impaired individuals. They rely on volunteers to donate, train and deliver trained Guide Horses free-of-charge to the visually impaired. The Foundation also wants it to be known that they have the greatest respect for the use of guide dogs. Their goal is to offer the blind community a choice.